Interleukin (IL)-12, being a major cytokine that induces T helper (Th) 1 differentiation and inflammatory response, has been postulated to be an important mediator of synovial inflammation in rheumatoid arthritis (RA). However, the regulation of IL-12 production in RA has not been elucidated. Our knowledge is mainly based on studies of the production of IL-12p40 and not the functional IL-12p70 heterodimer. We have studied the CD154-induced IL-12p40 and IL-12p70 production by synovial fluid (SF) macrophages from patients with RA. CD40 ligation induced the secretion of IL-12p40 but not IL-12p70. The observed increase in IL-10 and tumor necrosis factor (TNF)-α production indicated that SF macrophages responded to CD40 ligation. The expression of p40 mRNA was increased significantly and remained upregulated after CD40 ligation, whereas the increase of p35 transcript expression was observed only transiently and at a lower level. We further observed that dendritic cells (DCs) derived in vitro from SF macrophages produced IL-12p70. Most importantly, IL-4 and IL-13 primed SF macrophages to produce IL-12p70, whereas IFN-γ was not observed to activate IL-12p70 production in these cells, in contrast with normal peripheral blood monocytes. These results provide novel information about the regulation of IL-12p70 production and the function of the cytokine network in RA. Interleukin (IL)-12p70 is a heterodimer consisting of covalently linked p35 and p40 subunits encoded by two distinct genes . This heterodimer, which is produced at high levels by dendritic cells (DCs), drives naive T cells to differentiate into IFN-γ producing T helper (Th) 1 cells . The p40 subunit of IL-12 is produced in excess in relation to the heterodimer and also forms a homodimer that seems to antagonize the function of IL-12p70 [1, 2]. Upregulation of both p35 and p40 mRNA expression is needed for the secretion of IL-12p70, and there is increasing evidence that the expression of these subunits is independently regulated. The levels of mRNA for these subunits do not correspond to the levels of secreted IL-12p70, because the formation of the heterodimer is regulated also at translational or post-translational levels . DCs, monocytes, and macrophages are the main producers of IL-12p70 . Various microbial stimuli induce the production of IL-12 by DCs in the early phase of the immune response. CD40 ligation by CD154 expressed on activated CD4+ T cells seems to be the major inducer of IL-12p70 production [4, 5]. DCs produce IL-12p70 only for a short time in the early phase of their maturation and then become exhausted for IL-12 production . Macrophages, by contrast, generally need additional priming with IFN-γ or IL-4 in order to secrete IL-12p70 [1, 6]. IFN-γ and IL-4 also enhance the production of IL-12p70 by DCs [6, 7]. IL-12 synthesis is limited by several mechanisms, including anti-inflammatory cytokines such as IL-10 and tranforming growth factor beta . IL-12 production has also been shown to be downregulated by IFN-α and -β, ligation of Fcγ receptors, complement receptors or scavenger receptors on macrophages, prostaglandin E2, and corticosteroids [8–11]. Further, proinflammatory cytokines, such as tumor necrosis factor (TNF)-α and chemoattractants (macrophage chemoattractant proteins 1 to 4 and C5a) inhibit IL-12 production in macrophages [12–14]. IL-12 has been suggested to be the predominant cytokine inducing Th1-like phenotype of CD4+ T cells in rheumatoid arthritis (RA) [15–17], although the evidence is rather indirect. Although synovial T cells are of 'memory' phenotype , IL-12 can significantly enhance their IFN-γ production in synergy with IL-15 and IL-18 [17–19]. Studies in murine collagen-induced arthritis, an animal model of RA, suggest that IL-12 can promote arthritis in vivo. Exogenous IL-12 or transient systemic overexpression of heterodimeric IL-12 exacerbates collagen-induced arthritis [20, 21]. In contrast, neutralization of IL-12 attenuates the severity of collagen-induced arthritis, and both the incidence and the severity of the disease are reduced in IL-12-deficient mice [22, 23]. However, the role of IL-12 seems to be biphasic, as a low dose or early administration promotes the disease, whereas a high dose or administration during the chronic phase can suppress established disease [20, 24, 25]. In RA, increased levels of IL-12p70 and p40 proteins have been detected in synovial tissue homogenates in comparison with those from patients with osteoarthritis or ankylosing spondylitis , and RA synovial cells have been shown to spontaneously produce low levels of p40 and p70 proteins [18, 26]. Immunohistochemical and flow cytometric analyses have suggested that CD68+ macrophages are the main source of synovial IL-12 [18, 26, 27]. Previous studies suggest that IL-12 plays an important role in synovial inflammation in RA. However, the regulation of synovial IL-12p70 production has not been adequately studied. Mainly IL-12p40 production has been addressed , and therefore the regulation of IL-12p70 production has not been elucidated. Since triggering of CD40 is the main physiological inducer of IL-12 production, and we have earlier shown that synovial fluid (SF) macrophages express increased levels of CD40 , we studied the CD154-induced production of IL-12p40 and p70 by SF macrophages. We show that SF macrophages produce IL-12p40 but not p70 after CD40 ligation. The expression of p40 mRNA is increased significantly and remains upregulated after CD40 ligation, whereas p35 transcript expression increases only transiently and at a lower level. Furthermore, we show that SF macrophages differentiate in vitro into DCs producing IL-12p70. Unlike priming with IL-4 or IL-13, which was observed to activate IL-12p70 production in SF macrophages, priming with IFN-γ did not activate IL-12p70 production, in contrast to what was observed in normal peripheral blood (PB) monocytes. A total of 50 patients with RA (37 women and 13 men) were enrolled in this study. SF samples from the inflamed knee joints were collected by needle aspiration into heparinized tubes. RA was determined by the criteria of the American College of Rheumatology (formerly the American Rheumatism Association) . The median age of the patients was 61 years (range 29–86) and the median duration of the disease was 14 years (range 0.25–42). Seven patients had seronegative RA. Forty-five of the patients were treated with disease-modifying antirheumatic drugs, 36 with corticosteroids, and 41 with nonsteroidal anti-inflammatory drugs. Buffy coats from healthy blood donors were received from the Finnish Red Cross. This study was approved by the ethical committee of Turku University Central Hospital. All cytokines used were purified recombinant human proteins. IFN-γ was obtained from Schering-Plough Research Institute (Kenilworth, NJ, USA). Granulocyte/macrophage-colony-stimulating factor (GM-CSF) (Leucomax) was purchased from Schering Plough/Sandoz (Innishannon, Ireland) and IL-4 was purchased from R&D Systems (Abingdon, UK). IL-13, neutralizing mouse antihuman IL-10 monoclonal antibody (mAb) (9D7), and nonspecific mouse IgG1 were from DNAX Research Institute (Palo Alto, CA, USA). Neutralizing antihuman TNF-α mAb was purchased from Genzyme (Cambridge, MA, USA) and lipopolysaccharide (LPS) (Escherichia coli serotype 0127:B8) from Sigma (St Louis, MO, USA). CD154-transfected J558L cells (J558L-CD154) and control J558L cells were kindly provided by Dr P Lane (Birmingham, UK) and have been previously described . Antihuman CD3 and CD19 microbeads for magnetic cell sorting (MACS) were obtained from Miltenyi Biotec (Auburn, CA, USA). Fluorescein-isothiocyanate-conjugated antihuman CD14 and non-specific mouse IgG, and phycoerythrin-conjugated antihuman CD14, CD80, HLA-DR, and nonspecific mouse IgG, were purchased from Becton Dickinson (San Jose, CA, USA). Fluorescein-isothiocyanate-conjugated antihuman CD40, phycoerythrin-conjugated antihuman CD86, and unconjugated antihuman CD1a were obtained from PharMingen (San Diego, CA, USA). Nonconjugated antihuman CD83 was a gift from Dr TF Tedder (Duke University Medical Center, Durham, NC, USA). Phycoerythrin-conjugated goat antimouse IgG1 and IgG2b were purchased from Southern Biotechnology Associated, Inc (Birmingham, AL, USA). mAbs 2–6 (IgG1, antichicken CD4) and mAbs 9–8 (IgG2b, antichicken CD8α) were used as negative controls. SF samples were treated with bovine testicular hyaluronidase (10 μg/ml; Type IV-S, Sigma, Steinheim, Germany) for 15 minutes at 37°C. Synovial fluid mononuclear cells (SFMCs) from patients and peripheral blood mononuclear cells (PBMCs) from healthy controls were isolated by Ficoll-Paque (Pharmacia, Uppsala, Sweden) density gradient centrifugation and washed twice with Hank's buffered saline solution. Plastic-adherent SFMCs and PBMCs were isolated by incubating the cells on tissue-culture dishes (Falcon 1001, Becton Dickinson Labware, Lincoln Park, NJ, USA) in RPMI 1640 (Gibco BRL, Life Technologies, Paisley, Scotland) supplemented with 5% AB-serum (Finnish Red Cross, Helsinki, Finland), 0.3 mg/ml L-glutamine (Gibco BRL), 25 mM HEPES (Gibco BRL), 0.85 mg/ml NaHCO3 (Gibco BRL) and 100 μg/ml gentamicin (Biological Industries, Kibbutz Beit Haemek, Israel) for 1 hour at 37°C. Adherent SFMCs and PBMCs were suspended in Iscove's modified Dulbecco's medium (Gibco BRL) supplemented with 10% heat-inactivated fetal calf serum (HyClone Laboratories, Logan, UT, USA), 0.1 mM 2-mercaptoethanol (Sigma, St Louis, MO, USA), 10 mM HEPES, and 100 μg/ml of gentamicin. As evaluated in seven samples using flow cytometry, adherent SFMCs were 78 ± 11% CD14+ (mean ± SD). However, 90 ± 6% of these cells had the light-scatter characteristics of 'monocytes/macrophages', and are hereafter called SF macrophages. As evaluated in three samples, adherent PBMCs were 70 ± 9% CD14+. Of these cells, 76 ± 2% had the light-scatter characteristics of macrophages. To further purify the adherent PBMCs in some experiments, CD3+ and CD19+ cells were removed using MACS. In three of these samples, there were 78 ± 10% CD14+ cells and 91 ± 6% of the cells had the light-scatter characteristics of macrophages. The results obtained did not differ between adherent PBMCs and adherent PBMCs depleted of CD3+ and CD19+ cells by MACS, and these cells are hereafter called PB monocytes. J558L-CD154 transfectants and control J558L cells were irradiated (30 Gy) before use as stimulators. SF macrophages or normal PB monocytes (0.5–1 × 106 cells/ml) were cultured in Iscove's modified Dulbecco's medium + 10% fetal calf serum in a total volume of 1 ml with CD154 transfectants, control J558L cells, LPS (1 μg/ml; Sigma) or in medium only, in 24-well plates (Costar, Cambridge, MA, USA) for 24 or 72 hours. CD154 transfectants and control J558L cells were used at a ratio of 1:5 transfectants:macrophages. To study the effect of IFN-γ on IL-12 production, SF macrophages and PB monocytes were precultured with 10 or 100 ng/ml IFN-γ for 16 hours before addition of the transfectants or LPS for a further 24 hours. To study the effects of endogenous TNF-α and IL-10 on the production of IL-12, neutralizing antihuman TNF-α mAbs, neutralizing anti-IL-10 mAbs, or nonspecific mouse IgG1 (all 5 μg/ml) were added simultaneously with or 24 hours before the transfectants or the control cells. Alternatively, SF macrophages were first cultured with neutralizing antibodies for 24 hours, followed by addition of IFN-γ for 16 hours and then addition of the transfectants for the last 24 hours of culture. To study the effects of IL-4 and IL-13 on IL-12 production, we cultured SF macrophages in the presence of IL-4 or IL-13 (100 U/ml) for 72 hours before stimulation with the transfectants or the control cells for a further 24 hours. After the stimulations, the culture supernatants were collected, centrifuged, and separated from the pellet and frozen at -70°C until used for enzyme-linked immunosorbent assay (ELISA) determinations. 0.5 × 106 SF macrophages from patients or PB monocytes from healthy controls were cultured with IL-4 (500 U/ml) and GM-CSF (50 ng/ml) for 7 days in a total volume of 1 ml on 24-well plates (Costar). The same concentrations of the cytokines were added every third day by replacing 100 μl of the culture medium. On day 7, the cells from both SF and PB had the typical phenotype of monocyte-derived DCs [4, 31]. On day 7, CD154 transfectants (at a ratio of 1:5 transfectants:DCs), control cells (1:5), or medium only was added to the cultures by replacing 100 μl of the culture medium. After 24 hours, the supernatants were collected, centrifuged, and separated from the pellet and frozen at -70°C until they were used for ELISA determinations. Cells were harvested and the expression of cell-surface markers related to myeloid DCs was analyzed using flow cytometry. Cytokine levels in culture supernatants and SF were measured by cytokine-specific ELISAs. IL-12p40 and IL-12p70 were measured using matched capture and detection antibody pairs and standards purchased from R&D Systems. Plates (Immulon, Dynatech Laboratories, Chantilly, VA, USA) were prepared by coating with monoclonal capture antibodies (3 μg/ml antihuman IL-12p70 mAb or antihuman IL-12p40 mAb) overnight at room temperature followed by three washes with washing buffer (0.05% Tween 20 in phosphate-buffered saline solution) and then blocking with phosphate-buffered saline solution containing 1% BSA, 5% sucrose, and 0.05% NaN3 for 1 hour. After three washes, the samples and standards (IL-12p70 or IL-12p40), resuspended in 0.1% BSA, 0.05% Tween 20 in Tris-buffered saline solution, pH7.3, were added and incubated for 2 hours at room temperature. After the washing procedure, the biotinylated detection antibodies (350 ng/ml antihuman IL-12) were added for 2 hours. The plates were again washed three times and horseradish peroxidase:streptavidin (1:20000, 100 μl/well; 43–4323, Zymed Laboratories, San Francisco, CA, USA) was added for 20 minutes. The plates were washed and substrate solution (100 μg/ml 3,3',5,5'-tetramethylbenzidine (Sigma), 0.003% H2O2 in 0.11 M acetate buffer, pH5.5) was added. After sufficient incubation time (usually 30 minutes) in the dark at room temperature, 1.8 M H2SO4 was added to stop the reaction. The plates were immediately analyzed using a microtiter plate reader (Labsystems Multiskan® PLUS, Labsystems, Helsinki, Finland) set to 450 nm. The typical sensitivity of the assay was 8 pg/ml for IL-12p70 and 31 pg/ml for IL-12p40. IL-10 and TNF-α levels were measured using ELISA kits obtained from CLB (Amsterdam, Netherlands), and the sensitivity of the assays was 1 pg/ml. All ELISA determinations were performed in duplicate. IgM rheumatoid factor (RF) was detected in SF and serum samples using an in-house enzyme immunoassay. To eliminate the possible influence of RF in the IL-12 ELISAs, five pairs of SF and serum samples from patients positive for RF were treated for 1 hour at 4°C with fixed protein-A+Staphylococcus aureus cells (Zyzorbin, Zymed Laboratories). Samples were then centrifuged at 10,000 rpm (10,280 g) for 5 minutes and supernatants were collected. This treatment was performed three times and removed >50% of the IgM RF in the samples. Total RNA was extracted from 1.0 × 106 freshly isolated SF macrophages or 1.0 × 106 SF macrophages cultured with CD154 transfectants or control J558L cells for 6 or 24 hours using the Ultraspec-II RNA isolation system (Biotecx Laboratories, Inc, Houston, Texas, USA). For controls, total RNA was also isolated from 0.5 × 106 DCs derived from SF macrophages and stimulated with CD154 transfectants or control J558L cells for 24 hours, and from 1.0 × 106 CD154 transfectants or control J558L cells themselves. Total RNA was reverse transcribed using avian myeloblastosis virus (1st Strand cDNA Synthesis Kit for reverse transcriptase polymerase chain reaction (RT-PCR) (Roche Diagnostics, Mannheim, Germany) in a reaction volume of 20 μl in accordance with the manufacturer's instructions. Two microliters of cDNA was then used for PCR amplification in a 50-μl reaction mixture containing 1 U of DynaZyme II DNA polymerase (Finnzymes OY, Espoo, Finland), 5 μl of 10 × PCR Buffer (Finnzymes OY), 0.2 mM of each dNTP, and 15 pmol/μl of each primer. Housekeeping β-actin was amplified from the same pool of cDNA. Avian myeloblastosis virus reverse transcriptase was omitted from the control RT reactions. The following primers were used: IL-12p35 sense 5'-TCAGCAACATGCTCCAGAAGGC-3'; IL-12p35 antisense 5'-TGCATTCATGGTCTTGAACTCCACC-3'; IL-12p40 sense 5'-AAGCAGCAGAGGCTCTTCTGA-3'; IL-12p40 antisense 5'-ACCTGAACGCAGAATGTCAGG-3'; β-actin sense 5'-GGGTCAGAAGGATTCCTATG-3'; and β-actin antisense 5'-CCTTAATGTCACGCACGATTT-3'. Reactions were incubated in The DNA Engine™ Peltier Thermal Cycler (PTC-200) (MJ Research, Watertown, MA, USA) for 30 cycles (denaturation for 30 seconds at 95°C, annealing for 30 seconds at 62°C [p35], 60°C [p40], or 57°C [β-actin], and extension for 30 seconds at 72°C). PCR products were electrophoresed through a Seakem 1.5% agarose gel (FMC Bioproducts, Rockland, ME, USA), and visualized using ultraviolet light. Gels were denaturated in 0.4 M NaOH and transferred to a Hybond-N+ membrane (Amersham, UK) for southern hybridization in accordance with the manufacturer's instructions. Oligonucleotide probes, specific for a sequence internal to the primers used in the amplification, were labeled with γ-(32P)ATP (PerkinElmer Life Sciences, Boston, MA, USA) using T4 Polynucleotide Kinase (Promega, Madison, WI, USA) for 5' end labeling. The oligonucleotide probes were: IL-12p35: 5'-TGCACTTCTGAAGAGATTGATCATGAAGAT-3' and IL-12p40: 5'-TGCTACACTCTCTGCAGACAGAGTCAGAG-3'. In the analysis of the ELISA results, limit values of the assays were used for values below the detection limit. The Wilcoxon signed-rank test was used for paired samples and the Mann-Whitney U test for unpaired data to evaluate the significance of differences. Correlations were calculated using Spearman's rank correlation analysis. We first studied the levels of IL-12p40 and IL-12p70 in paired SF and serum samples from 35 patients with RA. IL-12p40 was found (>31 pg/ml) in 18 of 35 (51%) SF samples and in 21 of 35 (60%) serum samples studied, while IL-12p70 was detected (>8 pg/ml) in 16 of 35 (46%) SF samples and in 20 of 35 (57%) serum samples (Table 1). The levels of both IL-12p40 and p70 were significantly higher in serum than in SF (P < 0.05). A positive correlation between the SF and serum levels of IL-12p40 (r = 0.612, P < 0.0005) and p70 (r = 0.672, P < 0.0001) was found. In addition, positive correlations were found between the levels of IL-12p40 and p70 in SF (r = 0.963, P < 0.0001) and in serum (r = 0.959, P < 0.0001). To rule out the possible effect of RF in the measurements of IL-12p40 and p70, we determined the levels of RF in the same SF and sera. RF was positive (>18 U/ml) in 25 of 35 (71%) SF samples and in 28 of 35 (80%) serum samples (data not shown). However, no correlations between the levels of RF and IL-12p40 or p70 were found, either in SF or sera. Furthermore, no significant differences in the levels of IL-12p40 before and after removal of RF were observed in five pairs of serum and SF samples from patients positive for RF (SF: mean ± SEM 485 ± 140 pg/ml and 359 ± 152 pg/ml, respectively, and serum: 10,728 ± 6,272 pg/ml and 9,978 ± 5,874 pg/ml, respectively). aCytokine concentrations were determined using cytokine specific ELISAs. Each value is a mean of duplicate determinations. Limit values were used for levels under detection limits. We next analyzed the production of IL-12p40 and p70 by SF macrophages in response to CD40 ligation. No production of IL-12p70 was observed spontaneously or in response to CD40 ligation by SF macrophages or normal PB monocytes when the cells were cultured for 72 hours (Fig. 1a,1c). The results were similar after 24 hours of culture (data not shown). However, both SF macrophages and PB monocytes produced substantial levels of IL-12p40 after CD40 ligation when cultured for 72 hours (see Fig. 1b,1d). Significantly lower levels of p40, or none, were detected after 24 hours of culture (data not shown). After LPS stimulation, used as a control, neither type of cells produced either IL-12p40 or IL-12p70 (see Fig. 1). To determine whether SF macrophages were generally unresponsive to CD40 ligation, we measured the levels of IL-10 and TNF-α from the same culture supernatants. Both CD40 ligation and LPS increased the production of these cytokines (Table 2). CD40 ligation significantly increased the production of TNF-α by SF macrophages but not by PB monocytes. Production of IL-12p40 and IL-12p70 by synovial fluid (SF) macrophages and peripheral blood (PB) monocytes. 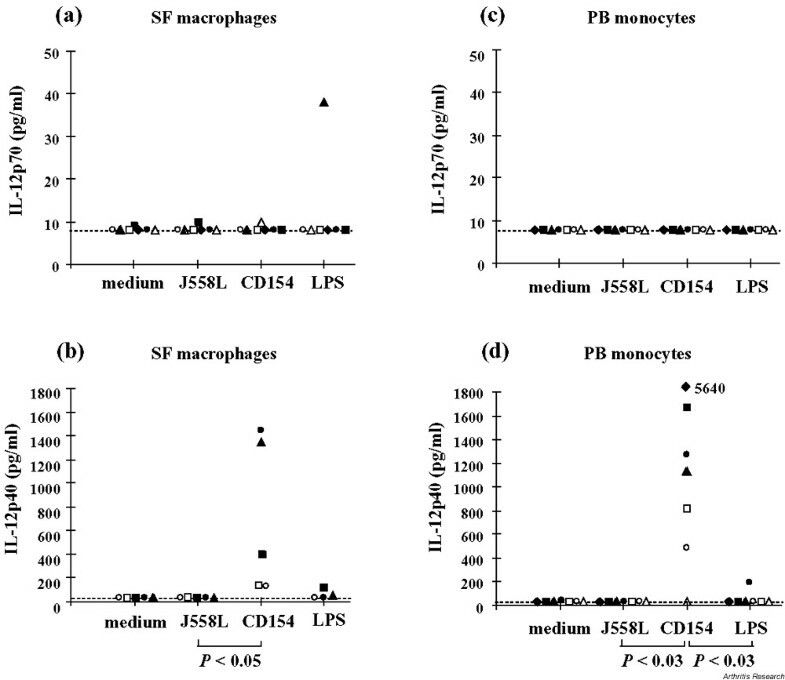 Production of IL-12p70 (a,c) and IL-12p40 (b,d) by SF macrophages from patients with rheumatoid arthritis and by normal PB monocytes, cultured for 72 hours in the presence of CD154 transfectants (at a ratio of 1:5 transfectants:responder cells), control J558L-cells (1:5), LPS (1 μg/ml), or in medium only. Supernatants were collected at the end of the culture period and the production of the cytokines was determined using ELISA. Individual values from each experiment (n = 5–7) are shown. Each patient or control subject is represented by the same symbol in two panels. The detection limits for the assays (8 pg/ml for IL-12 p70 and 31 pg/ml for IL-12 p40) are indicated as broken horizontal lines. LPS, lipopolysaccharide. 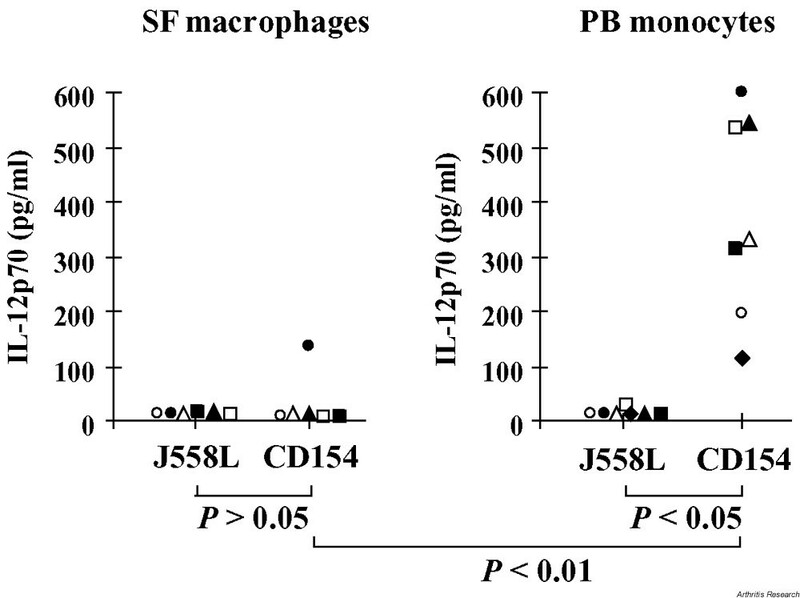 aSF macrophages and PB monocytes were cultured with irradiated control J558L-cells (1:5), CD154 tranfectants (1:5), or LPS (1 μg/ml) for 24 or 72 hours. Cytokine concentrations were determined using cytokine specific ELISAs. Results are presented as mean ± SEM pg/ml. n = 6 except bn = 5 and cn = 4. *P < 0.05 when compared with cells cultured with transfectant controls or in medium only at the respective time point. †P < 0.05 when compared with PB monocytes cultured in the presence of TNF-α for 72 hours. LPS, lipopolysaccharide. To investigate whether SF macrophages have the capacity to differentiate into DCs capable of producing IL-12p70 after CD40 ligation, SF macrophages and PB monocytes were cultured in the presence of IL-4 and GM-CSF for 7 days to induce their differentiation into immature DCs [4, 28, 31]. These cells were then further stimulated with CD154 transfectants for 24 hours. On day 8, cells cultured in the presence of IL-4 and GM-CSF had a typical phenotype of immature DCs, expressing CD1a, CD40, CD80, CD86 and HLA-DR but not CD14. Cells stimulated with CD154 transfectants upregulated the expression of CD83, a phenotypic marker for mature DCs (data not shown). 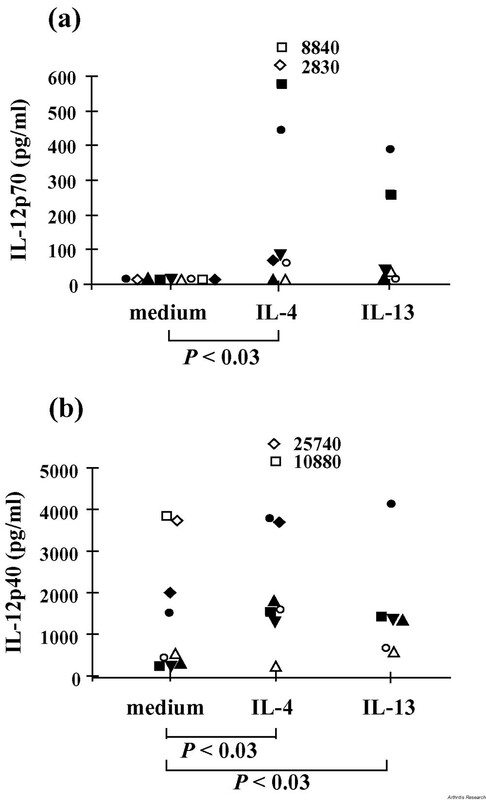 CD40 ligation induced the production of high levels of IL-12p40 and p70 (Table 3). aPB monocytes and SF macrophages were cultured with IL-4 and granulocyte/macrophage-colony-stimulating factor for 7 days, and irradiated control J558L-cells (1:5) or CD154 tranfectants (1:5) were added for 24 hours. Cytokine concentrations were determined using cytokine specific ELISAs. Results are presented as mean ± SEM pg/ml. bn = 3; cn = 4 except as otherwise indicated. Because it is known that expression of p35 and p40 mRNA does not necessarily correlate with p70 production, we analyzed the effects of CD40 ligation on the expression of p35 and p40 transcripts in SF macrophages by RT-PCR. Both transcripts were detectable in freshly isolated SF macrophages (Fig. 2). 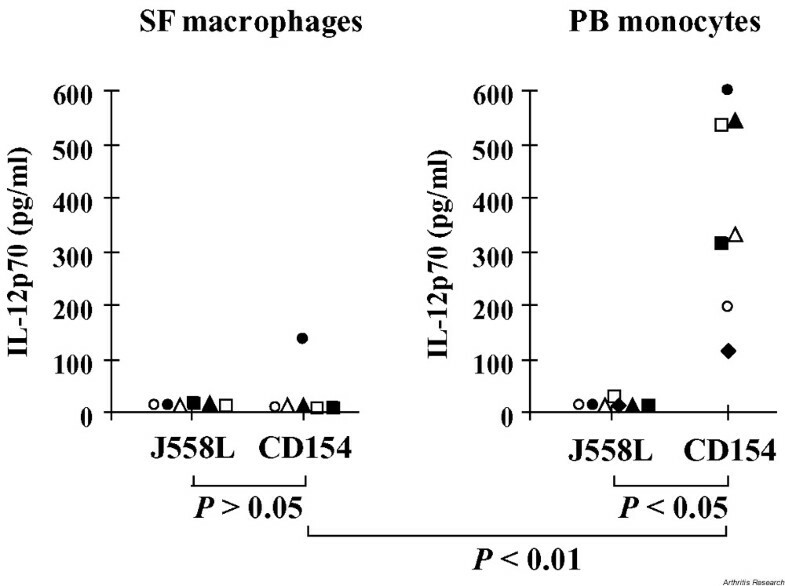 SF macrophages stimulated with CD154 transfectants for 6 or 24 hours expressed higher levels of p40 than those cultured with control J558L cells, demonstrating that CD40 ligation increased the expression of p40. The expression of p35 mRNA was upregulated only slightly – less and more transiently than that of p40. As a positive control, we studied p35 and p40 transcript expression in SF macrophage-derived DCs, which expressed high levels of both transcripts after stimulation with CD154 transfectants. The results from these RT-PCR analyses support those obtained studying IL-12p70 and p40 production by ELISA, showing that that low expression of p35 mRNA may explain the lack of p70 protein production in SF macrophages. RT-PCR analysis of IL-12p35 and IL-12p40 mRNA expression in synovial fluid (SF) macrophages. Total RNA from SF macrophages (SF M∅), either freshly isolated or incubated with CD154 transfectants or control J558L-cells for 6 or 24 hours. RNA was subjected to reverse transcription, and complementary DNA was amplified by primers specific for IL-12p35, IL-12p40, and constitutively expressed β-actin. cDNA specific for IL-12p35 and IL-12p40 was analyzed using Southern blotting. Reverse transcriptase was omitted from the control reactions. Analysis of SF macrophages from two patients is presented. As a positive control, expression of IL-12p35 and p40 mRNA was analyzed in CD154-stimulated DCs derived from SF macrophages. J558L cells, CD154 transfectants, and aqua were studied as negative controls. RT+ and RT-, incubation with and without reverse transcriptase, respectively. IL-4 and IL-13 have been shown to enhance IL-12p70 production by DCs and monocytes/macrophages [1, 6, 7]. We have earlier shown that IL-4 increases the ability of SF macrophages to function as antigen-presenting cells . Therefore, we studied whether IL-4 and IL-13 would induce IL-12p70 production. SF macrophages were precultured in the presence of IL-4 or IL-13 for 72 hours before stimulation with CD154 transfectants for 24 hours. IL-4 significantly primed the production of IL-12p40 and p70 (Fig. 3). Priming with IL-13 induced the production of IL-12p40 significantly. In addition, IL-13 primed the production of IL-12p70 in four of six samples studied. In two samples, the induction was clear, from <8 pg/ml to 255 and 384 pg/ml, and in two samples from <8 pg/ml to 23 and 28 pg/ml. Production of IL-12p40 and p70 by synovial fluid (SF) macrophages precultured with IL-4 and IL-13. SF macrophages were cultured in the presence of IL-4 (n = 9) or IL-13 (n = 6) (100 U/ml) or in medium only (n = 9) for 72 hours before addition of CD154 transfectants (at a ratio of 1:5 transfectants:SF macrophages) or control J558L cells (1:5) for a further 24 hours. Supernatants were collected at the end of the culture and the production of IL-12p70 (a) and p40 (b) was determined using ELISA. Individual values from each experiment are shown; each patient is represented by the same symbol in the two panels. Cells stimulated with control J558L did not produce IL-12p40 nor p70 (data not shown). IFN-γ is known to effectively prime macrophages to produce IL-12p70 . We therefore studied whether pretreatment with IFN-γ before CD40 ligation would induce IL-12p70 production by SF macrophages. Cells were precultured in the presence of 100 ng/ml IFN-γ for 16 hours before stimulation with CD154 transfectants for 24 hours. In only one of the samples studied did SF macrophages produce IL-12p70, and this was at a low concentration (Fig. 4). In contrast, CD40 ligation induced IL-12p70 production in all the samples of PB monocytes after pretreatment with IFN-γ. Results were similar when LPS was used as a stimulus (data not shown). Lower levels of IL-12p70 were produced by PB monocytes when a lower concentration of IFN-γ (10 ng/ml) was used for priming (data not shown). These results show that IFN-γ is not capable of priming SF macrophages to produce IL-12p70. Production of IL-12p70 after priming with IFN-γ. Synovial fluid(SF) macrophages (n = 6) and normal peripheral blood (PB) monocytes (n = 7) were precultured in the presence of IFN-γ (100 ng/ml) for 16 hours and then CD154 transfectants (at a ratio of 1:5 transfectants:macrophages) or control J558L-cells (1:5) were added for the last 24 hours of culture. Supernatants were collected at the end of the culture and the production of IL-12p70 was determined using ELISA. Individual values from each experiment are shown. Several cytokines have been shown to inhibit the production of IL-12p70. IL-10 and TNF-α are among them [1, 12, 13], and because these cytokines are present at high levels in RA joints, we studied whether blocking of their effect would induce IL-12p70 secretion in SF macrophages. Addition of neutralizing mAbs to IL-10 or TNF-α in the culture 24 hours before, or simultaneously with, CD154 transfectants did not affect the production of IL-12p70 (data not shown). However, SF macrophages precultured with neutralizing anti-TNF-α mAbs for 24 hours and then primed with IFN-γ for 16 hours before stimulation with CD154 transfectants produced, in two of three experiments, significantly higher levels (420, 1146, and <8 pg/ml) of IL-12p70 than those cells precultured in the presence of the control Abs (<8, 40, and <8 pg/ml, respectively). Preculturing the cells with neutralizing anti-IL-10 mAbs before IFN-γ priming had no effect on IL-12p70 production (data not shown). As we have previously shown, SF macrophages express increased levels of CD40 . Synovial T cells express CD154 [32, 33], indicating that synovial T cells can activate antigen-presenting cells via CD40. In the present study, we show that SF macrophages produce IL-12p40 but not the IL-12p70 heterodimer after CD40 ligation. Our data support the idea that the production of IL-12p40 and p70 are independently regulated and indicate that despite the augmented CD40 expression, triggering of CD40 does not induce IL-12p70 production in SF macrophages. We also provide evidence that CD40 ligation upregulates the transcription of p40 more consistently and to a higher level than p35 transcription, suggesting that the lack of p35 transcription limits p70 protein production. We also show that DCs derived from SF macrophages produce high levels of IL-12p70. These data suggest that SF macrophages contain the progenitors of myeloid DCs that are the main producers of IL-12p70 in the synovium. This is in line with recent findings showing that SF contains DCs and their myeloid progenitors that can differentiate into functional DCs . The role of IL-12p40 produced by SF macrophages remains unclear. IL-12p40 homodimer could inhibit the function of IL-12p70 in the synovium . Also, a possibility remains that the excess of IL-12p40 reflects the production of IL-23 composed of its own p19 subunit and p40 . IL-4 and IL-13 share many functions. While IL-4 production in inflamed joints has not been consistently shown, IL-13 produced by SF macrophages has been detected at significant levels . We observed that SF macrophages preincubated with IL-4 or IL-13 produced IL-12p70 after CD40 ligation. Also, IL-12p40 production was increased, suggesting that IL-4 and IL-13 enhance the production of both p35 and p40 subunits. In line with our results, IL-4 and IL-13 have been shown to enhance the production of IL-12 p70 in monocytes when the cells are primed for more than 24 hours . Likewise, IL-4 has been shown to enhance CD154-induced IL-12p70 production in human thymic and monocyte-derived DCs and in monocyte-derived macrophages [6, 7]. We have previously shown that SF macrophages cultured in the presence of IL-4 downregulate the expression of CD14, upregulate the expression of CD40, CD80, CD86, and HLA-DR, and acquire increased capacity to stimulate allogeneic T cells . The observed induction of IL-12p70 production by IL-4 is likely to be associated with the differentiation of SF macrophages into DCs. Like IL-4, IL-13 together with GM-CSF induces monocytes to differentiate into DCs . Although IL-4 induces Th2 differentiation in naive T cells, the capacity of IL-4 to direct either SF or PB T cells from RA patients towards a Th2 phenotype is impaired [17, 38]. Present results suggest that, in some circumstances, both IL-4 and IL-13 may in fact promote Th1 responses in the synovium by inducing synovial macrophages to differentiate into IL-12p70-producing DCs. In contrast to IL-4 and IL-13, priming with IFN-γ was not observed to activate SF macrophages to produce IL-12p70, although IFN-γ is known to prime normal macrophages to produce IL-12p70 . As expected, we observed high IL-12p70 production in IFN-γ-primed normal PB monocytes. This suggests that SF macrophages are unresponsive to IFN-γ and/or CD154, two signals provided by activated T cells and needed to produce high levels of IL-12p70. This finding is consistent with our observation that IL-12 concentrations are lower in SF than serum. This may suggest a novel counter-regulatory mechanism in RA and perhaps in other situations with chronic inflammation. Since the frequency of IFN-γ-producing Th1/Th0 cells is higher in RA joints than in PB [15–17], our data suggest that other Th1-promoting cytokines, such as IL-15 and IL-18, which have been detected at high levels in RA synovium , play an important role in RA. Substantial evidence indicates that TNF-α is a major proinflammatory cytokine in RA . However, we found that neutralization of TNF-α before priming with IFN-γ activated the production of IL-12p70. In line with our results, TNF-α has been previously shown to inhibit LPS- or Staphylococcus aureus-induced IL-12p70 production by IFN-γ primed human monocyte-derived macrophages . Our finding implies that TNF-α does not have a purely proinflammatory function in RA and emphasizes that TNF-α may be involved in suppression of IL-12 production in chronic inflammation . In the interpretation of these findings, the potential effect of treatment of the RA patients on IL-12 production should be taken into account. It would be interesting to know how the production of IL-12 is regulated during the early phase of RA. We have shown that SF macrophages do not produce IL-12p70 after CD40 ligation. However, IL-4 and IL-13, but not IFN-γ, are able to prime p70 production in these cells. Lack of p70 production may be due to the insufficient induction of p35 transcription. It seems that DCs in the synovium are the main producers of IL-12p70. These results reveal novel regulatory mechanisms in the complex cytokine network in RA synovium. We thank Anna Karvonen and Jasperiina Mattsson for expert technical assistance. Dr Riitta Saario and Dr Timo Möttönen are acknowledged for providing patient samples. Dr Peter Lane is acknowledged for providing the CD154 transfectants. This study was supported by the Academy of Finland (the Life 2000 Programme), special funds for Turku University Central Hospital, the Medical Foundation Duodecim, and the Duodecim Society of Turunmaa. Milja Möttönen is the recipient of a training grant from the Turku Graduate School of Biomedical Sciences.